Our optothermal tweezers were featured by Medical Device Developments as "Little wonders" (April 2019). 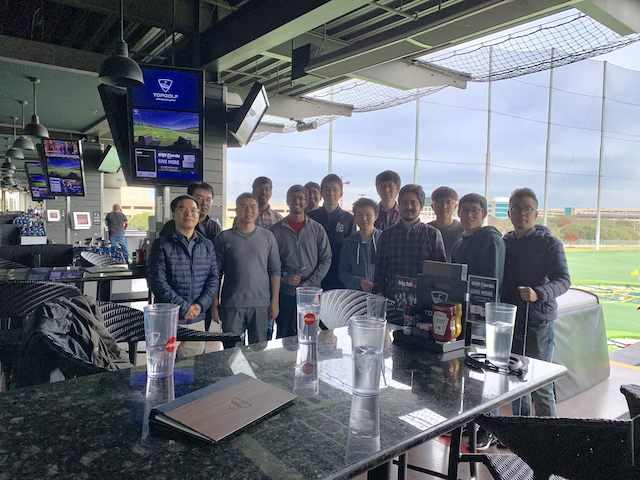 Our group received a DEFENSE UNIVERSITY RESEARCH INSTRUMENTATION PROGRAM (DURIP) Award (April 2019). 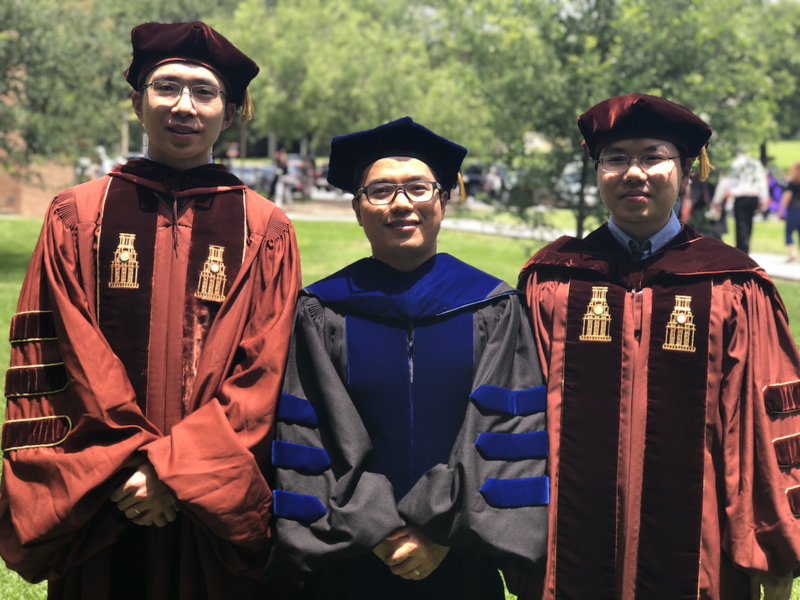 Yuebing Zheng has been appointed as a Walker Scholar in the Walker Department of Mechanical Engineering, UT Austin (March 2019). Mingsong Wang honored with 2018 Chinese Government Award for Outstanding Self-financed Students Abroad (TMI news) (March 2019). Our work All-Optical Reconfigurable Chiral Metamolecules has been featured by X-MOL as "Mater. Today：光镊技术组装手性超构材料" (March 2019). Our work All-Optical Reconfigurable Chiral Metamolecules has been featured by Nanowerk as "Bottom-up assembled chiral meta-molecules" (March 2019). Dr. Zheng is promoted to Associate Professor with tenure, effective 1 September 2019 (February 2019). Dr. Zheng has been named a Fellow of the Institute of Physics (January 2019). Dr. Zheng received the Franklin Award for Outstanding Teaching, Research and Service (The Walker Department of Mechanical Engineering, UT Austin) (January 2019). Our work on Tunable Fano Resonance and Plasmon-Exciton Coupling in Single Au Nanotriangles on Monolayer WS2 at Room Temperature, which is published in Advanced Materials 30 (2018) 1705779, is featured among "Breakthroughs of nanotechnology in 2018" (Jiajun Zhu‚ Baiquan Liu‚ and Daniel Bellet, Advances toward the development of nanotechnology: current challenges and new frontiers in materials, processes, devices, and applications, ISBN: 978-620-2-22099-6, Akademiker Verlag‚ Germany‚ 2019) (January 2019). 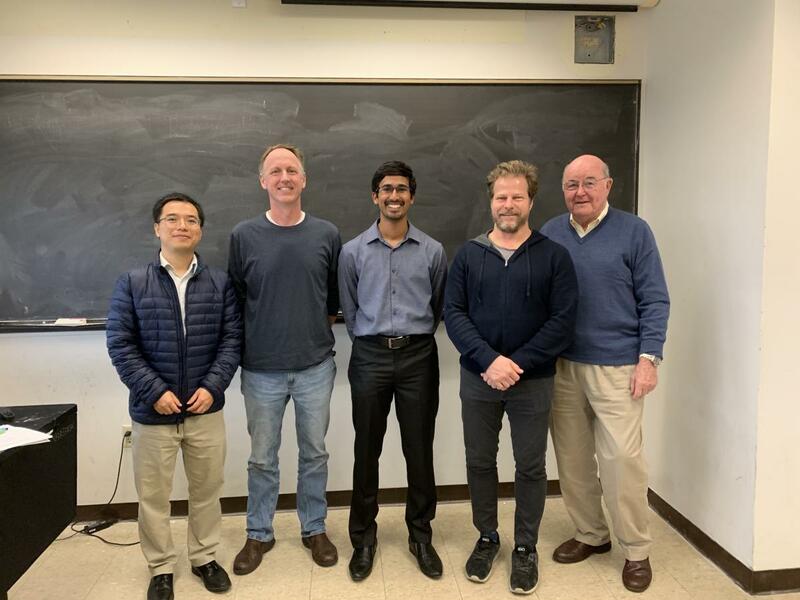 Bharath has successfully defended his Ph.D. dissertation and decided to join Intel. Congratulations to Dr. Rajeeva! (November 2018). Our work on Manipulating Nanoparticles in an Opto-Thermoelectric Field has been elected as OPN's Year in Optics and featured as Front Cover Article (November 2018). Dr. Zheng has been named a Fellow of the Royal Society of Chemistry (FRSC) (November 2018). The Engineering Translator- Episode 4 - A Game of Light with Yuebing Zheng (October 2018). Our work on Opto-Thermoelectric Nanotweezers, which is published in Nature Photonics 12 (2018) 195-201, is among Nature Collection of Nobel Prize in Physics 2018. Congratulations to Arthur Ashkin, Gerard Mourou and Donna Strickland on Nobel Prize in Physics for laser control! (October 2018). Our work on Nanoradiator-Mediated Deterministic Opto-Thermoelectric Manipulation, which is published in ACS Nano, has been featured by Nanowerk as "Nanoradiators allow precise optical manipulation of nanoparticles" (October 2018). Our work on "opto-thermoelectric tweezers and assembly" has been chosen as 2018 OPN's Year in Optics and featured as Manipulating Nanoparticles in an Opto-Thermoelectric Field in the December issue of Optics & Photonics News. Each year, the December issue of Optics & Photonics News—the monthly magazine of The Optical Society—highlights the most exciting optics research to emerge in the preceding 12 months (October 2018). 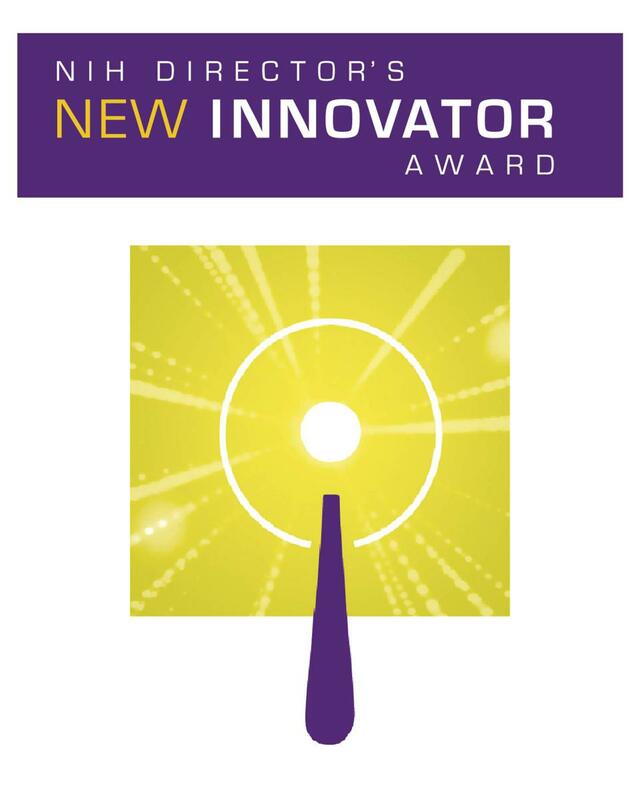 Dr. Zheng has been selected to receive Materials Today Rising Star Award (TMI News) (September 2018). Our work on Opto-Thermophoretic Manipulation and Construction of Colloidal Superstructures in Photocurable Hydrogels will be featured as Front Cover Article of ACS Applied Nano Materials (August 2018). Our work on Opto-thermoplasmonic Nanolithography for On-Demand Patterning of 2D Materials, which was published in Advanced Functional Materials 7 (2018) 1803990, has been featured by Xincailiao (August 2018). Our work on Opto-thermoplasmonic Nanolithography for On-Demand Patterning of 2D Materials, which was published in Advanced Functional Materials 7 (2018) 1803990, has been featured as Back Cover Article (August 2018). Our work on Tunable Fano Resonance and Plasmon-Exciton Coupling in Single Au Nanotriangles on Monolayer WS2 at Room Temperature, which was published in Advanced Materials 30 (2018) 1705779, has been highlighted by Materials Views China (August 2018). Our work on Opto-thermoplasmonic Nanolithography for On-Demand Patterning of 2D Materials, which was published in Advanced Functional Materials 7 (2018) 1803990, has been featured by Nanowerk (August 2018). Our undergraduate student Majd A Alabandi discusses his research on "Integrating Mobile App Software with Bubble Pen Lithography." Our work on Chiral Metamaterials via Moiré Stacking was selected as cover article by Nanoscale (July 2018). Our work on Opto-Thermophoretic Manipulation of Colloidal Particles in Non-Ionic Liquids was selected as cover article by Journal of Physical Chemistry C (June 2018). Dr. Eric Hill was selected to receive Leadership of an Independent Junior Research Group in Germany. Congratulations! (May 2018). Our work on Mid-Infrared Superabsorbers Based on Quasi-Periodic Moiré Metasurfaces has been featured as cover article by Chinese Optics Letters (May 2018). Our work on Opto-Thermoelectric Nanotweezers has been featured by Focus Laser World as "Opto-thermoelectric nanotweezers improve particle-trapping efficiency. "; also featured on the magazine cover (May 2018). Dr. Zheng serves at The 2018 GEC Catalyst Awards Judging Committee. See Awards announcment "Personal Connected Health Alliance and Green Electronics Council Partner to Host GEC Catalyst Awards at 2018 Connected Health Conference" at ABC-6; NBC-2; Fox-5; CBS-8; (April 2018). Our work on "Reconfigurable Opto-Thermoelectric Printing of Colloidal Particles" has been featured by Atlas of Science as "Erasable opto-thermoelectric printing." (April 2018). Intel's HPC editorial program features some of our research in "Nanoparticle Research Provides New Applications for Industry and Everyday Life." (April 2018). Our work on "Tunable Fano Resonance and Plasmon-Exciton Coupling in Single Au Nanotriangles on Monolayer WS2 at Room Temperature" has been featured as Frontispiece of Advanced Materials (April 2018). Our work on "Point-and-Shoot" Synthesis of Metallic Ring Arrays and Surface-Enhanced Optical Spectroscopy" has been featured as Front Cover Article of Advanced Optical Materials (April 2018). Our work on Opto-Thermoelectric Nanotweezers has been published in Nature Photonics: L. Lin, M. Wang, X. Peng, E. N. Lissek, Z. Mao, L. Scarabelli, E. Adkins, S. Coskun, H. E. Unalan, B. A. Korgel, L. M. Liz-Marzán, E. L. Florin, and Y. B. Zheng. Opto-Thermoelectric Nanotweezers. Nature Photonics (March 2018). Xiaolei Peng has been selected to receive a University Graduate Continuing Fellowship for 2018-2019. The fellowship carries a stipend of $28,000 over 12 months (with a total value of award at $40,000), speaking highly of his record of accomplishments (February 2018). Our work "Moiré Metamaterials and Metasurfaces" published in Advanced Optical Materials is among Most Accessed of 01/2018 (January 2018). Our papers "Light-Directed Reversible Assembly of Plasmonic Nanoparticles Using Plasmon-Enhanced Thermophoresis" and "Bubble-Pen Lithography" have been featured by an NPG Asia Materials review paper (January 2018). Our work "Moiré Metamaterials and Metasurfaces" will be featured as Inside Cover Article of Advanced Optical Materials (January 2018). Our work "Light-Directed Reversible Assembly of Plasmonic Nanoparticles Using Plasmon-Enhanced Thermophoresis" has been featured in ACS Virtual Issue "Progress in Top-Down Control of Bottom-Up Assembly" (November 2017). Our work "Bubble-Pen Lithography" has been featured in ACS Virtual Issue "Progress in Top-Down Control of Bottom-Up Assembly" (November 2017). Our work "Design and Applications of Lattice Plasmon Resonances" will be featured as Nano Research cover article (November 2017). Our work on Opto-Thermophoretic Assembly of Colloidal Matter [Science Advances 3 (2017) e1700458] has been featured by Laser Focus World as newsbreak "Opto-thermophoretic method easily assembles colloidal matter." (October 2017). Our work on Opto-Thermophoretic Assembly of Colloidal Matter [Science Advances 3 (2017) e1700458] has been featured by Nanowerk as "Assembling colloidal matter with an opto-thermophoretic strategy." (September 2017). Our work on Opto-Thermophoretic Assembly of Colloidal Matter [Science Advances 3 (2017) e1700458] has been featured by Nanotechweb as "Opto-thermophoretic technique assembles colloidal nanoparticles." (September 2017). Our work on Opto-Thermophoretic Assembly of Colloidal Matter [Science Advances 3 (2017) e1700458] has been featured by Xincailiao "胶体纳米粒子的新革命：光热解技术." (September 2017). Our work on Opto-Thermophoretic Assembly of Colloidal Matter [Science Advances 3 (2017) e1700458] has been featured by TodayChemical as "胶体纳米粒子的新革命：光热解技术." (September 2017). Our work on "Interfacial-Entropy-Driven Thermophoretic Tweezers" will be featured as Lab on a Chip outside back cover article (August 2017). Our work "Moiré Chiral Metamaterials" has been highlighted by MaterialsViewsChina (August 2017). Our work on "Controlling Plasmon-Enhanced Fluorescence via Intersystem Crossing in Photoswitchable Molecules" will be featured as a Frontispiece of journal Small (August 2017). Our work on "Plasmon-Trion and Plasmon-Exciton Resonance Energy Tranfer from a Single Plasmonic Nanoparticle to Monolayer MoS2 " will be featured as Nanoscale cover article (August 2017). Our work "Moiré Chiral Metamaterials" has been highlighted by Nanotechweb (July 2017). Our work "Moiré Chiral Metamaterials" has been highlighted by Nanowerk (July 2017). Daniel Vong has received a 2017-2018 fellowship from the Cockrell School of Engineering (July 2017). Xiaolei has received a 2017-2018 fellowship from the Cockrell School of Engineering (July 2017). Our work "Thermophoretic Tweezers for Low-Power and Versatile Manipulation of Biological Cells" has been featured by X-MOL平台; 微信公众号 (July 2017). Our work "Moiré Chiral Metamaterials" has been featured on inside front cover of Advanced Optical Materials (July 2017). Bharath has accepted a summer internship at Oculus VR, which was acquired by Facebook, and will do R&D on virtual-reality displays in Seattle this summer (May 2017). Mingsong Wang has been selected to receive a University Graduate Continuing Fellowship for 2017-2018. The fellowship carries a stipend of $28,000 over 12 months (with a total value of award at $40,000), speaking highly of his record of accomplishments (March 2017). Our work "Bubble-Pen Lithography" has been featured as "Nanotechnology in a Bubble" in Book "Nanotechnology: The Future is Tiny" by Michael Berger (2016). Our work "Moire Nanosphere Lithography" has been featured as "Novel Nanosphere Lithography to Fabricate Tunable Plasmonic Metasurfaces" in Book "Nanotechnology: The Future is Tiny" by Michael Berger (2016). Dr. Zheng has been selected as one of the Chemical Communications Emerging Investigators (November 2016). Our work "Bubble-Pen Lithography" has been highlighted as "纳米光刻：激光泡沫笔光刻技术仿造胶体纳米颗粒" by 微头条 (September 2016). Bubble-pen lithography for nanomanufacturing (August 2016). Our work "Tunable Graphene Metasurfaces with Gradient Features by Self-assembly-based Moiré Nanosphere Lithography" has been highlighted as "Tunable Graphene Metasurfaces with Gradient Features" by "Materials Views" (August 2016). Our work "Tunable Graphene Metasurfaces with Gradient Features by Self-assembly-based Moiré Nanosphere Lithography" has been highlighted as “Nanosphere lithography makes graphene moiré metasurface” by Nanotechweb (August 2016). Dr. Zheng has been selected as one of the Journal of Materials Chemistry Emerging Investigators (August 2016). Our work "Tunable Graphene Metasurfaces with Gradient Features by Self-assembly-based Moiré Nanosphere Lithography" has been featured as a Nanowerk spotlight article "Moire Nanosphere Lithography allows fabrication of large-area tunable graphene metasurfaces" (August 2016). Xiaolei Peng and Bharath Rajeeva have been awarded Continuing Graduate Fellowship (August 2016). We are organizing a symposium on Functional Plasmonics at 2016 MRS Fall Meeting, Boston, MA (27 November-2 December, 2016). We successfully organized a FocusSession: Micro-/nano-manipulations: Fundamentals and Applications at Progress in Electromagnetics Research Symposium (PIERS) 2016 in Shanghai, China (8-11 August, 2016). Thank you all for your participation! We have been awarded a Graduate School Mentoring Fellowship for 2016-2017. Our work "Regioselective Localization and Tracking of Biomolecules on Single Gold Nanoparticles" has been highlighted as "Biomolecule tracking with gold nanoparticles" by MaterialsViews (March 2016). Our work "Bubble-Pen Lithography" has been highlighted as "Bubble-Pen Lithography Deftly Handles Nanoparticle" by Photonics Spectra (March 2016). Xiaolei Peng won the Poster Competition Prize at 2016 ASME NanoEngineering for Medicine and Biology Conference. He presented his work on "Plasmonic Tweezers for Biology and Medicine: towards Low-Power and Versatile Manipulations of Cells and Biomolecules" (Feburary 2016). Our work "Bubble-Pen Lithography" has been highlighted as "Nanolithography: Laser bubble-pen lithography patterns colloidal nanoparticles" by LaserFocusWorld (Februay 2016). Our work "Bubble-Pen Lithography" has been highlighted as "Bubble-Pen Lithography Deftly Handles Nanoparticle" by SPIE BACUS Newsletter (Februay 2016). Our work "Bubble-Pen Lithography" has been highlighted as "Bubble-pen writes new chapter for nanomaterials" by Materials Today (February 2016). Our work "Bubble-Pen Lithography" has been highlighted in Editor's Choice as "Patterning colloids with microbubbles" by Science (January 2016). Our work "Bubble-Pen Lithography" has been highlighted as "Laser-driven bubble-pen developed for fabricating tiny structures" by Engineering.com (January 2016). Our work "Bubble-Pen Lithography" has been highlighted as "‘Bubble pen’ can precisely write patterns with nanoparticles as small as 1 nanometer" by Kurzweil.net (January 2016). Our work "Bubble-Pen Lithography" has been highlighted as "Engineers invent a bubble-pen to write with nanoparticles" by Opli (January 2016). Our work "Bubble-Pen Lithography" has been highlighted as "Engineers use laser beams to write with bubbles" by eeDesignIt (January 2016). Our work "Bubble-Pen Lithography" has been highlighted as "Writing Nanoparticles with a Bubble-Pen" by WorldIndustrialReport (January 2016). Our work "Bubble-Pen Lithography" has been highlighted as "Engineers invent a bubble-pen to write with nanoparticles" by ScienceDaily (January 2016). Our work "Bubble-Pen Lithography" has been highlighted as "Scientists write with nanoparticles utilizing a laser and a bubble" by XENERO (January 2016). Our work "Bubble-Pen Lithography" has been highlighted in popular Indian newspapers Business Standard, NDTV, Financial Express, and India Today (January 2016). Our work "Bubble-Pen Lithography" was featured on Daily Planet Show by Discovery Channel-Canada (January 19 2016). Our work "Bubble-Pen Lithography" has been highlighted as "Laser-Driven 'Bubble Pen' Patterns Nanoparticles" by IEEE Spectrum (January 2016). Our work "Bubble-Pen Lithography" has been featured as "UT breakthrough on nanoparticles makes Ant-Man look like Sasquatch" by Statesman (January 2016). Our work "Bubble-Pen Lithography" has been highlighted as "Researchers Develop Lithographic Pen for Nanoparticles" by The Daily Texan (January 2016). Our work "Bubble-Pen Lithography" has been highlighted as "科学家利用激光气泡即可操纵纳米粒子" by 网易科技，激光网，激光制造网，响水新闻网, 电子成品世界，Chinese Academy of Sciences (January 2016). Our work "Bubble-Pen Lithography" has been highlighted as "Bubble-Pen Lithography Deftly Handles Nanoparticle" by Photonics.com (January 2016). Our work "Bubble-Pen Lithography" has been highlighted as Research News "Bubble-Pen Lithography" by OSA Optics&Photonics News (January 2016). Our work "Bubble-Pen Lithography" has been highlighted as "Innovative Bubble-Pen Lithography Enables Efficient Handling of Nanoparticles" by AzoNano (January 2016). Our work "Bubble-Pen Lithography" has been highlighted as "Engineers Invent a Bubble-Pen to Write with Nanoparticles" in UT News (January 2016). Our work "Thermodynamic synthesis of solution processable ladder polymers" is featured as outside front cover article by journal Chemical Science (January 2016). Our work "Bubble-Pen Lithography" has been highlighted as "神奇的泡沫笔光刻技术" in Cailiaoren (材料人)(January 2016). Our work "Bubble-Pen Lithography" has been highlighted as "Writing With a Bubble Pen" in ChemistryViews (January 2016). Our award-winning image was featured in call-for-paper for 2016 IEEE Photonics Conference, 29th Annual Conference of the IEEE Photonics Society (January 2016). Our work "Bubble-Pen Lithography" has been highlighted in Black in America (December 2015). Our work "Bubble-Pen Lithography" has been highlighted in Cool Physics (December 2015). Our work "Bubble-Pen Lithography" has been highlighted in Gentaur (December 2015). Our work "Bubble-Pen Lithography" has been highlighted in Opennano (December 2015). Our work "Bubble-Pen Lithography" has been highlighted in Nanotec (December 2015). Our work "Tunable multiband metasurfaces by moiré nanosphere lithography" has been featured as one of HOT Nanoscale articles published in 2015 (December 2015). Our work "Bubble-Pen Lithography" has been highlighted as "Bubble-pen lithography patterns nanodevices" in Nanotechweb (December 2015). Our work "Bubble-Pen Lithography" has been featured as a Nanowerk spotlight article "Nanotechnology in a Bubble" (December 2015). Our work on "Engineering of Parallel Plasmonic-Photonic Interactions for On-Chip Refractive Index Sensors" is featured as research news by Atlas of Science (December 2015). Our work "Thermodynamic synthesis of solution processable ladder polymers" has been featured as one of Hot Chemical Science articles for December (December 2015). Our work on "Regioselective Localization and Tracking of Biomolecules on Single Gold Nanoparticles" is featured as research news in MaterialsViewsChina.com (October 2015). Bharath Rajeeva was selected to receive the Fall 2015 Professional Development Award (October 2015). Our paper "Tunable Multiband Metasurfaces by Moire Nanosphere Lithography" is featured as outside front cover by journal Nanoscale (October 2015). Our paper "Regioselective Localization and Tracking of Biomolecules on Single Gold Nanoparticles" is featured as frontispieces by journal Advanced Science (October 2015). Our paper "Plasmofluidics: Merging Light and Fluids at the Micro-/Nano-Scale" is featured as frontispieces by journal Small (September 2015). 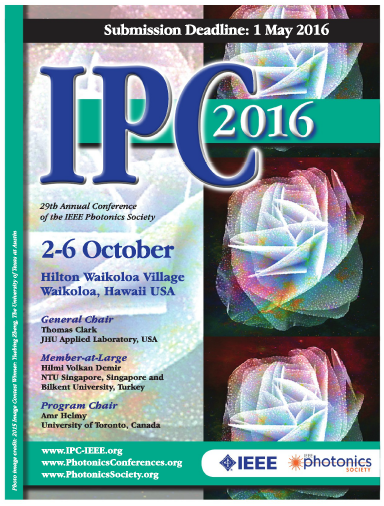 Our work on “Blossom in Photosynthesis” won the IEEE Photonics Society Image Contest and is featured as the cover of the October 2015 issue of the IEEE Photonics Society Newsletter (August 2015). Mingsong Wang has been selected to receive the Warren A. and Alice L. Meyer Endowed Scholarship in Engineering (July 2015). Bharath Rajeeva has been selected to receive the 2015-2016 George J. Heuer, Jr. Ph.D. Endowed Graduate Fellowship from the Cockrell School of Engineering (July 2015). Zilong Wu has been selected to receive Summer 2015 Professional Development Award (July 2015). Bharath Rajeeva has been selected to receive the Harris L. Marcus Graduate Fellowship in Materials Science & Engineering (July 2015). "Moire Nanosphere Lithography" has been featured as a Nanowerk spotlight article "Novel Nanosphere Lithography to Fabricate Tunable Plasmonic Metasurfaces" (June 2015). Dr. Zheng has been selected as one of the Analyst Emerging Investigators (June 2015). Zilong Wu has been selected to receive the 2015 Graduate Student Conference Grant to give talks at the SPIE meeting in San Diego (April 2015). Dr. Zheng gave an invited talk at the symposium in honor of Prof. Paul S. Weiss at the ACS Meeting Denver 2015. Congratulations, Paul! Dr. Zheng serves as an Associate Editor of Journal of Electronic Materials (Springer). Our research on mobile medical tools was featured in "16 Amazing Science Breakthroughs from 2014". Dr. Zheng received Asian/Asian-American Faculty Staff Association Professional Development Award (February 2015). Dr. Zheng received 3M Nontenured Faculty Award (February 2015). Dr. Zheng serves as an Editorial Board Member for Scientific Reports, a journal from Nature Publishing Group, the publishers of Nature (February 2015). Dr. Zheng serves as an Associate Editor of journal "Applied Nanoscience" (Springer). "Viologen-Mediated Assembly of and Sensing with Carboxylatopillararene-Modified Gold Nanoparticles” (JOURNAL OF THE AMERICAN CHEMICAL SOCIETY 2013, 135(4) : 1570-1576) was among the “Top 100 Most Cited Chinese Papers Published in International Journals in 2013” according to the Institute of Scientific and Technical Information of China (October 2014). We thank Arnold and Mabel Beckman Foundation for the generous support of our research through Beckman Young Investigator (BYI) Award to Dr. Zheng. The BYI Program with grants in the range of $750,000 is “intended to provide research support to the most promising young faculty members in the early stages of academic careers in the chemical and life sciences particularly to foster the invention of methods, instruments and materials that will open up new avenues of research in science.” (16 August 2014). UT News; ABC; Longhorn Network. 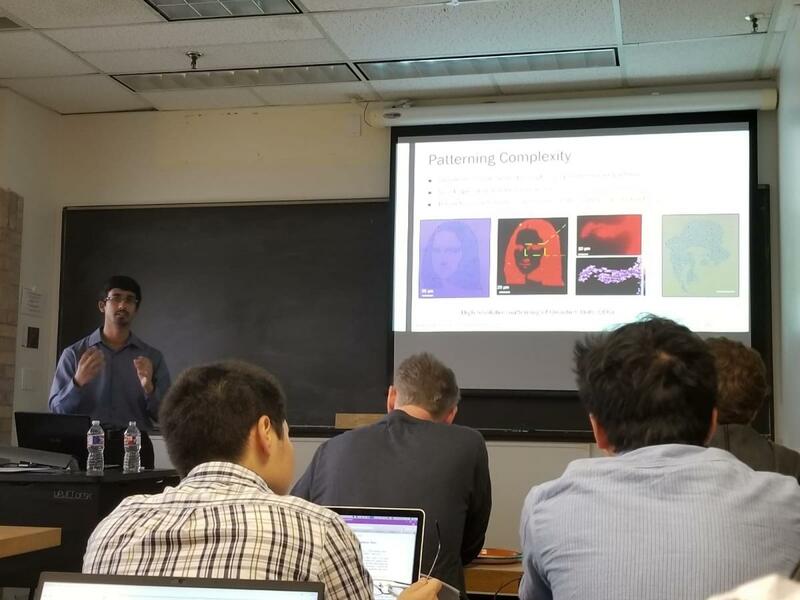 Dr. Zheng gave an invited talk at the Workshop on "Flexible SERS Substrates: Challenges and Opportunities" at Washington University in St. Louis. The workshop is sponsored by Army Research Lab, Army Research Office and Edgewood Chemical Biological Center (25-26 June 2014). Dr. Zheng chaired a session and gave a talk at the CLEO conference (8-13 June 2014). Dr. Zheng co-chaired a session on "Plasmonics Enhanced Devices" at the OSA Incubator Nanophotonic Devices: Beyond Classical Limits, OSA Headquarters, Washtington DC (14-16 May 2014). Dr. Zheng has been awarded the Graduate School Alumni Soceity (GSAS) Early Career Award by The Pennsylvania State University. The award recognizes alumni who have demonstrated exceptional success in their chosen field within the first ten years after obtaining their graduate degrees (4 April 2014). Related: Two Penn State graduate alumni recognized for early career achievements (24 April 2014). National Photonics Initiative Launched (July 2013). "Photoresponseive Molecules in Well-Defined Nanoscale Environments" was featured as Cover Article by journal Advanced Materials (18 January 2013). On "Molecules Sense Curvature at the Nanoscale"
On "Solar Cells and Solar Cell Windows"